Enjoy a private after hours Vatican tour with a professional Vatican lecturer and receive exclusive access to sites that are not generally open to the public. Skip the long lines and meet your guide to enjoy Cappella Niccolina, The Room of Gold and Bramante’s Staircase, as well as Vatican highlights that include the Sistine Chapel and the Museo Pio Clementino. Your after hours Vatican tour beings during the Vatican Museums’ standard hours of operation, ending at the Sistine Chapel just after closing time. This one-of-a-kind, exclusive access allows the discerning traveller to explore some of the Museum’s intriguing areas that are not usually open to the public. Additionally, enjoy a rare privilege:having the Sistine Chapel all to yourself –with no crowds! Meet your private English speaking guide from Italy’s Best and have access to rooms of the museums that are closed to the public. Your dedicated Vatican security guard will lift the velvet ropes, granting you entry to the Room of Gold, which displays gold ornaments made by Etruscan goldsmiths, dating back to the fifth and sixth centuries. These jewels are still relevant today, serving as inspiration for the collections of modern jewellery designers. Next, ascend Bramante’s Staircase, commissioned by Pope Julius II in 1512 to connect the Palace of Innocent VIII (1484-1492) with the city of Rome. These spiral stone stairs stand inside a square tower and at one time, were only climbed on horseback. Considered one of the most interesting architectural jewels of the Vatican Museums, this staircase was also used by Michelangelo to enter the building when he was painting the Sistine Chapel. Have an up-close look at the Pope’s private place of worship, the Cappella Niccolina, adorned with gold from the Americas brought by Christopher Columbus. Revel at the wondrous Renaissance frescoes by Beato Angelico, which represent the martyrdom of St. Lawrence and St. Stephen. Your after hours Vatiacn tour continues with stops at the museum’s signature exhibits which include: Gallery of Candelabra, Gallery of Tapestries, Pinacoteca, Hall of Maps and last, but not least, the Sistine Chapel. Imagine yourself alone in the chapel; no pushy crowds and no guards yelling silenzio! You, your group and your guide will be the only people inside the chapel! 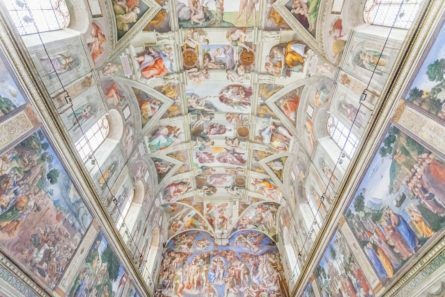 What’s more, unlike the usual group tour where guides are not permitted to speak inside the chapel, your guide will have a full 30 minutes to take you through the artwork, explaining the highlights and symbolism behind Michelangelo’s masterpieces. After the after hours Vatican tour wraps, you are welcome to linger and spend some of your own time alone in the chapel. The Vatican reserves the right to make changes to the tour as rooms may be closed at the last minute for reasons of restoration or at the general discretion of the Vatican Museums. We can therefore not guarantee visits to any specific rooms. Throughout the tour, the Vatican Security Officer accompanies you.